Missing out on rides all week long, I did a FFFF SF2G bayway to work on Friday. We rode a standard Bayway route and skipped the BTN. At 7:40, I joined the first two riders: Gavin and one other. At the water stop we waited for the rest of the group. There were 27 riders! I joined the first group of 5 that left. Eventually, it shrunk down to just me and Gavin, who offered me breakfast courtesy of Google. By the time we got there (9:40), there was not a lot of food left. There were mostly donuts, bagels, and fruits left. I went for the bagel, toasted!, instead of the donuts. While eating and chatting, we asked to participate in a video to promote google maps for bikes. 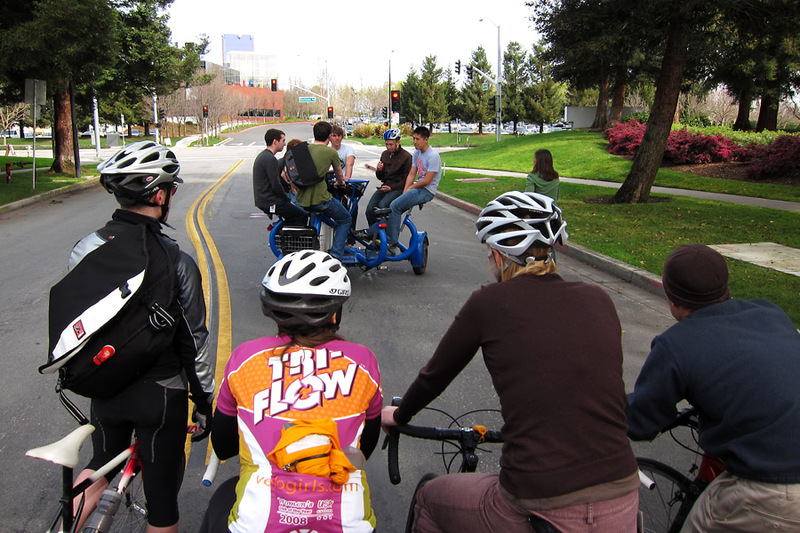 We rode around in a few circles, got filmed, then almost got run over by the “conference bike”. Route on Garmin …and yes. My HR stayed in Z2/z3.